Newspaper ABC carries an interesting story this morning about concerns that the Government has been busy filling up its embassies world-wide with sympathetic ambassadors, to make life difficult for the Partido Popular should they win in November’s General Election. The paper reports that since September last year 71 new appointments have been made, a dozen of which were made after the announcement by Prime Minister Zapatero that the elections would be brought forward to November. So many appointments at the fag-end of a parliament has raised eyebrows and led the PP to question whether the Government is trying to tie the hands of an incoming conservative administration. PP sources told the newspaper that if they win they will study each appointment on a “case by case” basis, and will not hesitate to repeal any appointments that they see fit. 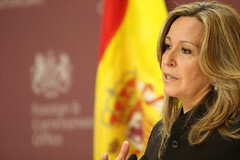 Foreign Minister Trinidad Jiménez (pictured) has expressed her anger at the PP’s complaints, saying that the Government is well within its rights to appoint ambassadors and diplomats at any point of a parliamentary term.